Human nature often seeks to find the black cloud in a blue sky. It starts with a worried thought, which then generates a few more concerning thoughts. Give this a spin and you are likely to have a storm spiraling in your mind. This cognitive tension doesn’t only affect mental health but can also create physical manifestations and emotional tension. Let’s talk about anxiety, the most common of all psychological disorders. Anxiety is our natural response to stress. We all experience worry, nervousness, fear, and apprehension. In some situations anxiety is beneficial, it warns us about stress, and helps us to prepare and pay attention. Even more so, if faced with a potential life threat, feelings of anxiety are not only normal but necessary for our survival (the familiar fight-or-flight response). However, if worry becomes excessive, uncontrollable, or irrational, lasts for an extended period (longer than 6 months) and interferes with day-to-day living, this is most likely to be a type of anxiety disorder. Overall, someone with anxiety disorder would have a fear or anxiety that is out of proportion to the situation or is inappropriate for their age. Anxiety disorders are the most prevalent group of mental disorders affecting approximately 30% of adults at any given point in life. Also, women are more likely than men to suffer from an anxiety disorder. Here are some of the most common types of anxiety disorders (according to The Diagnostic and Statistical Manual of Mental Disorders, DSM-5). A chronic disorder involving excessive anxiety and worry about a number of different things, occurring more days than not for at least 6 months, along with three or more other symptoms of GAD being present (specified in the DSM). People with GAD find it difficult to control the worry, sometimes without even knowing what the exact cause for their anxiety is. GAD is the most common of all anxiety disorders. Recurrent sudden panic attacks of intense fear or intense discomfort that escalate to their peak within minutes. A panic attack can lead to breathing difficulties, palpitations, sweating, shaking, dizziness, confusion, etc. The abrupt surge of panic can occur from a calm state or an anxious state. Irrational fear, anxiety, and avoidance of a specific object or situation (e.g., flying, animals, heights, seeing blood). The fear or anxiety is out of proportion to the actual danger posed by the specific cause, the person is unable to control the anxiety, and it causes significant distress in important areas of functioning. Fear or anxiety about one or more social situations in which the individual may be negatively judged, scrutinized, and/or rejected by others. The person may worry about appearing visibly anxious (e.g. blushing, stuttering) and as a result often chooses to avoid social situations. 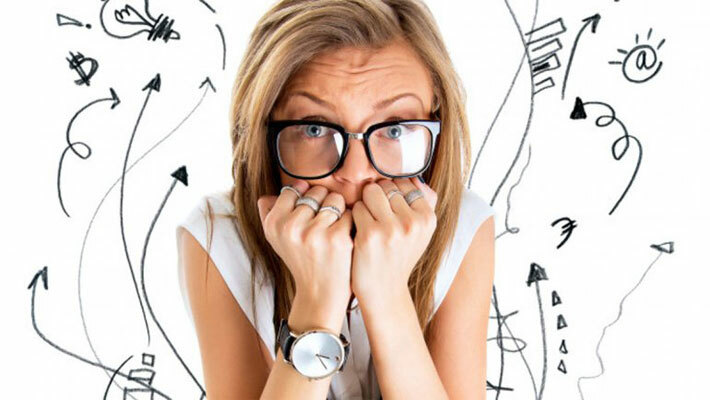 Anxiety is also a major key part of other disorders such as obsessive-compulsive disorder (OCD, recurring thoughts that lead to performing specific and repeated behaviors), post-traumatic stress disorder (PTSD, anxiety following a traumatic event), separation anxiety disorder (fear of being away from home or loved ones), and more. Also, it is important to note that while anxiety and depression can occur separately, it’s not unusual that they happen at the same time. The exact causes for anxiety disorders are currently still unknown, but likely a combination of factors play a role. These can include genetic, environmental, psychological and developmental factors, certain medical conditions and/or medications, as well as brain chemistry. Apart from the aforementioned, much research involves the study of specific brain areas responsible for controlling fear. To treat anxiety it is most important that we identify the sources of anxiety and thoroughly review our lifestyle. Once we recognize the source of anxiety, we can begin to replace anxiety with reflection. For some people, medical treatment isn’t necessary. Rather, certain lifestyle changes and healthy habits may be enough to help cope with the symptoms and make anxiety a bit more manageable. Here are four basic but highly necessary strategies to start with, which have been repeatedly proven to reduce anxiety, in most people, both in the short and long-term. This is a great form of distraction. It boosts general mood, improves sleep, and reduces tension. For some people regular exercise works as well as medication. It can lower the body’s stress hormones (cortisol) and help release endorphins, which are chemicals that improve mood and act as natural pain killers. Not getting enough sleep can trigger anxiety. Try and establish a bedtime routine and schedule a full 7-9 hours of snooze time. Certain foods may cause mood changes. Stay hydrated, ditch processed foods, and eat a healthy diet rich in complex carbohydrates, vegetables and fruits, and lean proteins. Also, try to reduce caffeine intake. We all have different thresholds for how much caffeine we can tolerate. The breath is a great indicator of our anxiety level; in anxious states breathing becomes shallow, rapid, and erratic. Slow down your breathing and practice deep belly breathing from your diaphragm. It helps activate the body’s relaxation response if done properly. Of course, there are countless more tips and tricks that help change our anxious thoughts, calm the brain, and relax the body. Everyone is different, and apart from the mentioned basic techniques, we must tailor our action plan according to what works best for us. However, in moderate or severe cases of anxiety, professional treatment is necessary. There are two types of treatment options, psychotherapy and medication, or a combination of the two. Therapy is a good place to start as it can help uncover underlying causes of worries and fears. Once revealed, therapy continues in helping the individual learn how to relax, look at situations in new and less frightening ways, and develop better coping and problem-solving skills. There are many types of therapy used to treat anxiety, however the leading approaches are Cognitive Behavioral therapy and Exposure therapy. Medications that are typically used to treat anxiety include anti-anxiety medications and antidepressants. Medication will not cure anxiety disorders, instead they work to give relief of symptoms, balance brain chemistry and help prevent strong episodes of anxiety. Unfortunately, many people with anxiety don’t seek help. Even though anxiety can be challenging, there are effective treatments and many ways of prevention. Don’t ignore the warning signs, you can save yourself a lot of stress by getting help sooner than later. Anxious people have bigger “personal space.” Personal space is one’s intimate boundary, one that should not be invaded by others. In most people, this space ranges from 25- 50 cm away from the face. In persons experiencing anxiety disorders, this perceived space is gradually larger.